To do this right, use about 2 tablespoons of coconut oil and massage into your scalp and let sit for about an hour. Once you have let it sit, wash out with your normal conditioner or shampoo. Your hair will still be a little oily for the next 24 hours, but know it is working magic on your hair. This key ingredient is good for giving your scalp a well-deserved massage and cleaning out any loose dandruff you may have before washing your hair. Use salt before applying shampoo to clean off your scalp before treating for dandruff. Wet your head and apply a handful of baking soda to your scalp and give it a nice good massage. Baking soda has active ingredients which help to get rid of fungi that could be causing dandruff. This will leave your hair dryer than normal, but after a few weeks, the natural oils in your hair will appear. Ready to get a little scientific? To really fight dandruff, it is a good idea to also adjust your pH level of your scalp to fight off the yeast causing dandruff to appear. 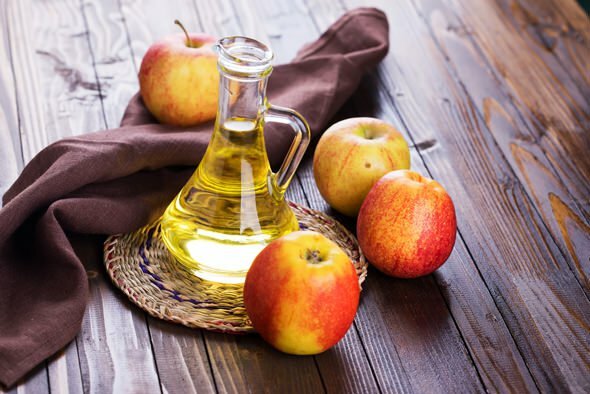 Just take a quarter cup of apple cider vinegar, a cup of water, mix in a spray bottle and apply to scalp. Leave there for 15 minutes and then wash it out. Smelly? Yes. Great for removing bacteria from your scalp? You betcha! Crush some garlic and massage into your scalp to get the full effect. To avoid the smell, mix garlic with honey before applying to your scalp. Afterwards, wash your hair and enjoy the antimicrobial effect of garlic.